Good condition hardback book in a Very Good condition dustjacket. 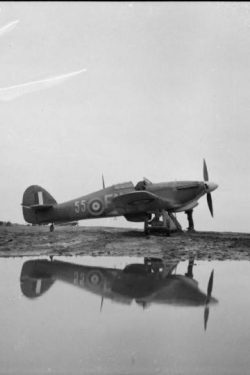 In late 1941 on Churchill’s direct orders, Force Benedict saw the deployment of two RAF Hurricane Squadrons to Murmansk. 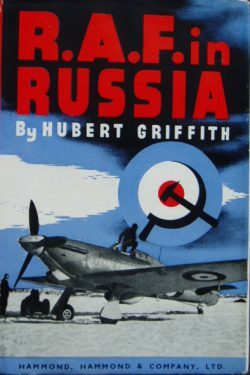 The aim was to show the quality of the Hurricane aircraft if flown properly and to teach Soviet pilots and their ground crews how to handle the British military equipment that would be soon be supplied to the Soviet Union. 151 Wing carried out 365 sorties during its stay at Vaenga, claiming 11 Messerschmitt fighters and three Ju88 bombers shot down. Four ‘Orders of Lenin’ were awarded to British Pilots (the equivalent of the VC), the first time such awards had been given to non-Russians. 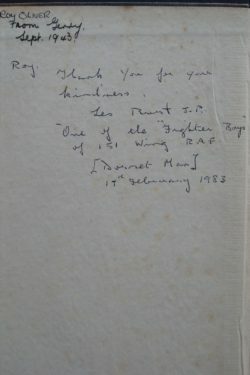 This book was written by the Wing Adjutant of the expedition immediately upon his return in order to answer the many questions generated by intense public interest. The signature in this book requires some research in order to establish the role of Mr Burt in the expedition.